It all started in the late 80s when Oldsmobile started to get a wrap as an old mans car. 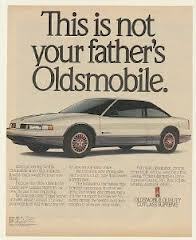 The company would embark on a campaign that was entitled “not your father’s oldsmobile,” it would fail miserably deepening the stereotype further into the roots. It did not help that the car claiming to not be an old man car looked like an old man’s car. The glory days of selling a million cars a year every year all through the 80s were over. As well as the brand sold in the 80s, when the 90s came around, Oldsmobile found itself without any real direction. As other divisions of GM prospered, Oldsmobile lost its place on the market, lost its design and was forced to sell rebadged versions of other GM cars, like Pontiac or Chevrolet of which GM had put their performance focus on. Eventually, Oldsmobile became a bastion for testing new concepts for GM (VanHulle, 2014). Late 90s models became cookie cutter and uninspiring Lindsay Vanhulle of the Lansing State Journal quotes the New York Times brutal review of the ’04 Oldsmobile Alero “Not a terribly bad car nor an especially good one, the Alero’s white-bread mediocrity is typical of the small to midsize cars that Detroit has churned out for years,” it wrote. 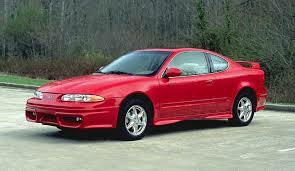 “The Alero is, in fact, a virtual twin of the Pontiac Grand Am. Both are transportation devices, cars for people who don’t like cars very much” (VanHulle, 2014). In other words the vision was gone and people could no longer tell distinctly what an Oldsmobile was. In 1998 Oldsmobile headquarters will move to Detroit completely and, despite all their best efforts, Oldsmobile’s demise would finally come due to its affiliation with GM. A loss in profit for the automotive giant meant that the Lansing Icon would be laid to rest. In 2000, GM would announce that Oldsmobile will be phased out, and on April, 29th 2004, the black cherry red Alero would be the last Oldsmobile to ever be made on the Lansing Car Assembly line. Oldsmobile, the oldest running produced automobile died at 107. The last Alero is on display at the GM Heritage Center (VanHulle, 2014). It has been 10 years since Olds died, and though Oldsmobile may be gone from the Production lines in Lansing, it still lives in the harts of those that were born and raised in the city that birthed them. I still have much pride in my hometown of Lansing whenever I see an occasional Olds grace my presence on the street. Remember it was Olds not Ford that brought you the assembly line, the V-8, and automatic transmition. It was Lansing not Detroit.